State law prohibits the use of lead sinkers and jigs weighing 1 ounce or less, regardless of length, in all fresh waters of New Hampshire. The sale of these lead sinkers and jigs is prohibited in the state of New Hampshire. 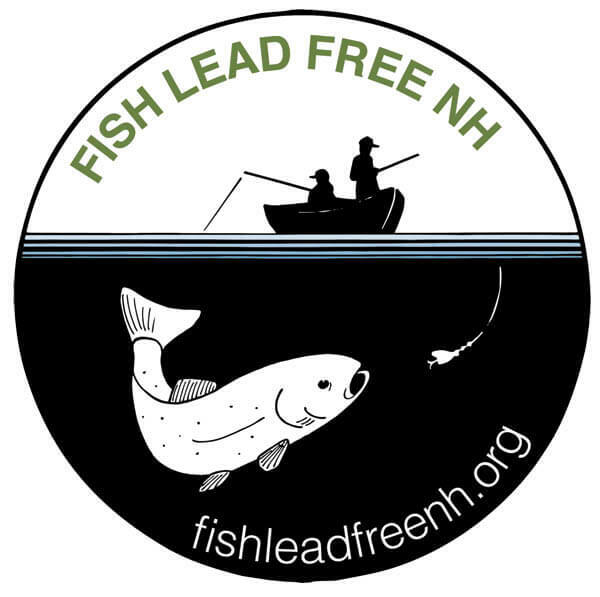 Learn more at fishleadfree.org. Possession and use of live fish for bait: Only the following species shall be possessed and used as live fish for bait when fishing any freshwaters of the state: rainbow smelt (Osmerus mordax), longnose dace (Rhinichthys cataractae), blacknose dace (Rhinichthys atratulus), northern redbelly dace (Phoxinus eos), lake chub (Couesius plumbeus), creek chub (Semotilius atromaculatus), fallfish (Semotilius corporalis), golden shiner (Notemigonus crysoleucas), common shiner (Luxilus cornutus), emerald shiner (Notropis atherinoides), spottail shiner (Notropis hudsonius), silvery minnow (Hybognathus nuchalis), creek chubsucker (Erimyzon oblongus), longnose sucker (Catostomus catostomus), white sucker (Catostomus commeronii) and killifish/tomcod (Fundulus sp.). Approved bait fish species (excluding white suckers) may be taken for personal use by licensed anglers with up to six traps not over 18 inches long each, with an opening not over one inch in diameter, or a circular drop net not over 48 inches in diameter; or a square net of equal area. Each trap must have the angler’s name and address on it. Daily limit 2 quarts (liquid measure). There is no daily limit for white suckers. Commercial harvesting of bait is permitted with a bait dealer’s license and under specific rules. The license is available from the New Hampshire Fish and Game Department. More on Bait Fish Information. While taking fish in open water, two hooks may be used for bait per line, one with a single hook point and the other with no more than three hook points, except for certain lake trout and salmon lakes, where only a single hook with a single hook point may be used (see Lakes & Ponds with Special Rules). A person may use up to 2 lines for open-water fishing. The taking of brook trout, brown trout, rainbow trout, lake trout, trout hybrids, and salmon between two hours after sunset and one hour before sunrise is prohibited. Traps, nets, fish houses, holding boxes, or other receptacles used to take, hold, or to keep live bait fish in public waters must be marked with the name and address of the owner and user. While anglers are being guided, as defined in RSA 207:1 XII and XIII, and taking freshwater fish by trolling (as defined on Definitions) the number of lines being used for angling shall not exceed the legal number of lines allowed for each angler, excluding the guide(s). Fishing tournaments on New Hampshire waters require a permit. Applications are taken on a first-come, first-served basis and are available from the New Hampshire Fish and Game Department. Except for bass tournaments, the permit fee is $49.00. Bass fishing tournaments: Applications are accepted beginning October 1 for permits requested for the following year. Applications for each bass tournament event received between October 1 and December 1 will be assigned a random computer-generated number. Applications received after December 1 will be issued a sequential number on a first-come, first-served basis. When there are multiple requests for bass tournaments on the same date and waterbody, preference will be given to the application(s) for bass tournament(s) with the lowest assigned number(s). The permit fee is $49.00, except for “catch and release” and “club level” bass tournaments which are $10.00. The sale of freshwater fish is prohibited, other than approved bait fish sold by licensed individuals. Snagging fish in freshwaters is prohibited. Any fish accidentally snagged must be immediately released to the water. Exceeding daily bag limits of fish is prohibited, whether taken from one or several water bodies. No person may have in his possession at one time more wildlife (including fish) than he may lawfully take in 2 days. No person shall have live lake trout, landlocked salmon, brook trout, black bass, northern pike, or black crappie in their possession, except if the person is a bass tournament permittee or is an aquaculturist permittee or has a permit to import, possess, or release these fish. Release of fish in waters other than where caught is prohibited. Fish must be returned to the water where taken. Culling of fish, except during permitted bass tournaments, is prohibited. The use of alewives, carp, or goldfish as live bait while fishing is prohibited. The use of shad or whitefish as bait for cusk is prohibited. Importation of live fish or their eggs, including bait fish, is prohibited without a special permit. Except as otherwise specifically permitted, it is unlawful to use or have in possession a set line, net, fishing otter, trawl, grapple, spear, jack, jack light, poisons, explosives, or electrical device or any other device for killing or stunning fish. To counsel or aid another in violating a fishing rule is prohibited. The use of a gaff to take fish in any fresh waters of the state is prohibited. To continue to take or attempt to take fish after filling the daily bag limit for that species of fish is prohibited. It is illegal to tag, brand, fin-clip, or otherwise mark any fish prior to release without written permission to do so from the N.H. Fish and Game Executive Director. Time is of the essence. Play and release the fish as quickly and carefully as possible. When landing a fish, use a net with fine mesh or rubber net to avoid injury. A net is probably not necessary for small fish. Keep the fish in the water as much as possible. A fish out of water is suffocating and could be injured. When releasing a fish, handle it as little as possible when removing the hook. When handling the fish, do not let it flop around or squeeze it. Gently hold the fish around the middle and upside down while removing the hook. This position calms the fish and deters it from moving around. Remove the hook with small pliers or use your thumb and forefinger to loosen and back out the hook. If a hook cannot be easily removed, cut the leader as close as possible to the hook. The hook will rust or fall out in a short time. To revive a tired fish, hold it in a swimming position with one hand under its bottom jaw and the other hand grasping the fish in front of the tail. Gently move the fish back and forth through the water until it is able to swim away. Want to learn how to fish, enhance your fishing skills, help turn a friend into a fishing buddy? Check out Let’s Go Fishing classes from N.H. Fish and Game’s Aquatic Resources Education team! Free courses are offered throughout the state by trained volunteer instructors who bring a wealth of experience and knowledge to help anglers get started. Courses available for adults and children on fly fishing, saltwater fly fishing, fly tying, ice fishing and more. Visit fishnh.com. When in doubt about whether a fish you have caught is legal, play it safe and release the fish unharmed. See where we’ve stocked trout! <>Violation of any fishing rule or regulation may result in the loss of the violator’s license or privilege to fish in New Hampshire.